Two weeks ago I’d never even heard of a Cajón. Since then I’ve researched them, made one and watched it played in a live gig; it’s been quite the fortnight. Cajón is the Spanish word for ‘box’, which I’ll grant you seems exactly the right name for it, as at first glance it is indeed a box. 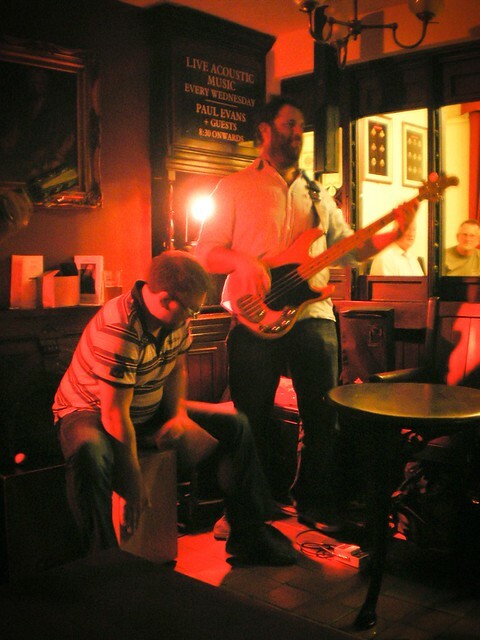 Beyond that though, it is a percussion instrument that quite literally gives the player a drum kit in a box. Depending on where the player strikes the front plate, or tapa (see, I’m even down with the technical lingo) different tones can be achieved giving a bass drum, snare and a nice crisp snap tone. Construction is not difficult; if you can make a box you’re most of the way there. Internally, 2 guitar strings are tensioned against the tapa to provide the snare sound. You need a mechanism to tension the strings; I copied the one Meinl use on their Headliner series Cajón which works brilliantly. A hole in the rear of the box allows the sound out, and is the location to mike the instrument if required. 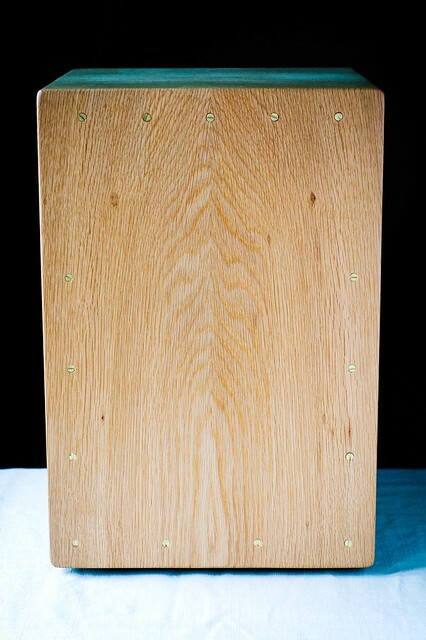 The tapa is the other important bit, which I made from quarter sawn white oak. This was bookmatched and then machined down to a thickness of 3.5mm. The spacing of the screws and the tension of the tapa to the box is important, as you need to have enough movement to get the ‘snap’ sound at the top of the Cajón, but enough tension lower down the instrument to get the bass response. Not being of a musical persuasion myself, I asked our friend Ad Collins to come and have a go on the Cajón to see how it sounded. By complete coincidence Ad was playing a gig with The Paul Evans Trio that night, so he took Cajón along to give it a baptism in the world of live performance. The Cajón is a remarkable thing, the range of tone possible from such a simple instrument has to be heard to be believed (the sound quality of the video clips does no justice to the Cajón unfortunately, but you get the general idea). The fact that you can make one yourself with relatively simple kit is a further part of the attraction, OK I used a fully equipped workshop but what did you expect? A really enjoyable project to make and thoroughly gratifying to see it played so skilfully in a live performance. I forecast more instruments on the horizon. See the next blogpost for blueprints on how to make your own. Click here. Sounds great Ed, I’d love one. How much would you charge to make one? Glad to see that the Cajón is becoming popular! It is indeed a really handy instrument, now you can carry a whole percussion in the box! I see you also made a snare into the Cajón which makes a really nice sound in my opinion. 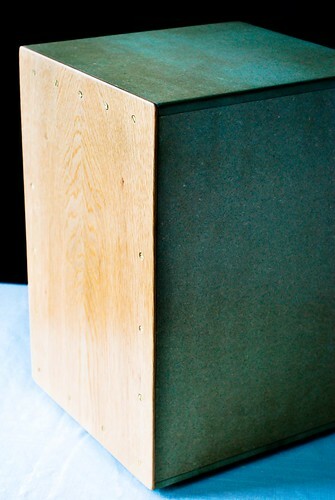 Please take a moment on my site about the Cajón : http://www.thecajon.com. It includes all the history of the instrument (which is quite intriguing, if you ask me), and many other intteresting things about the Cajón that you might find handy. Cheers and keep up the good work with the band! 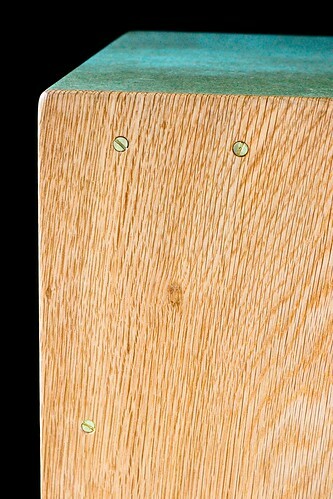 I’m browsing your blog in the wrong order, just saw the blueprints… the actual Cajon looks great!